CHRIST - POWERS OF KARMA - MICHAEL - THE GRAIL - SOPHIA. 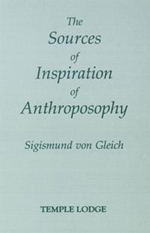 Gleich presents "the fivefold stream of inspiration out of the spiritual world" which forms the basis of anthroposophy. This book is not meant as a theoretic or academic work, however, but to help those "who feel it could become fruitful to work with these truths, to become inwardly connected to them".